Small-displacement off-road bikes rock. 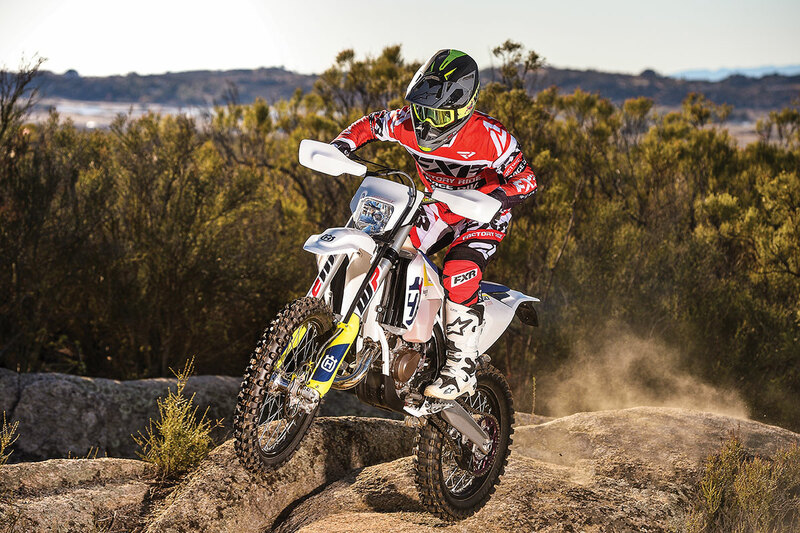 The 2019 Husqvarna TE150 is one of the most effective trail bikes ever, building on a long history of smaller-is-better thinking in the off-road world. Check the records; small-displacement off-road bikes have always been considered a secret weapon, going all the way back to the first Penton, the Hodaka, the Kawasaki KDX and the KTM 200. 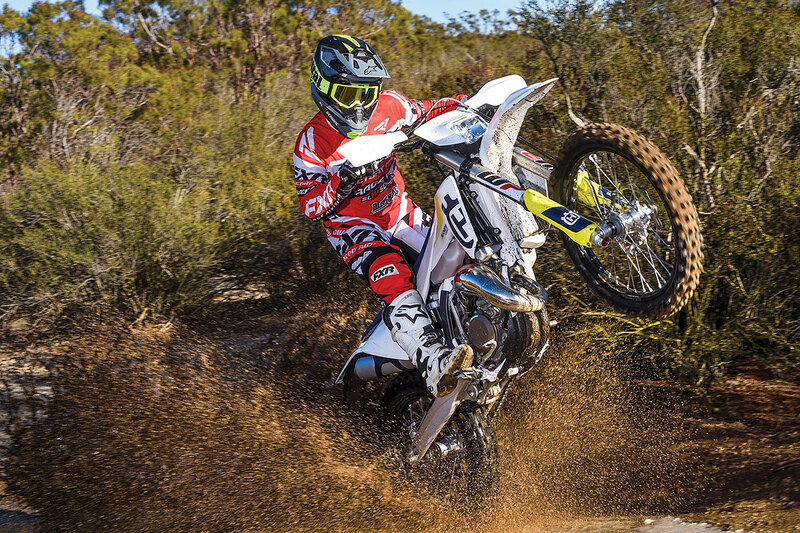 The Husqvarna TE150 is the current product of that legacy, but it must contend with a recent market trend toward massive 450cc race bikes that have only kickstands and 18-inch wheels as off-road credentials. The 150 concept makes sense, but sense isn’t always a part of the winning formula. Today, small-bore two-stroke lovers are more of a cult than a class. 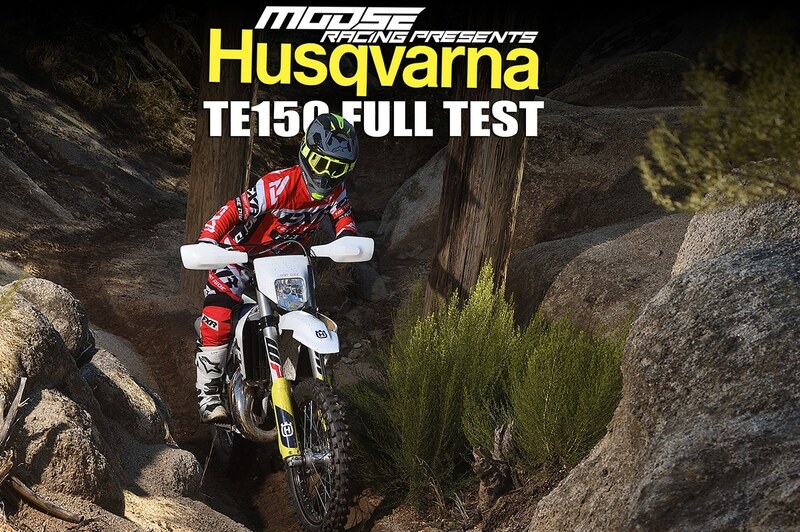 The Husqvarna TE150 might be the ultimate off-road bike for a certain type of trail riding. What kind is that? Level. 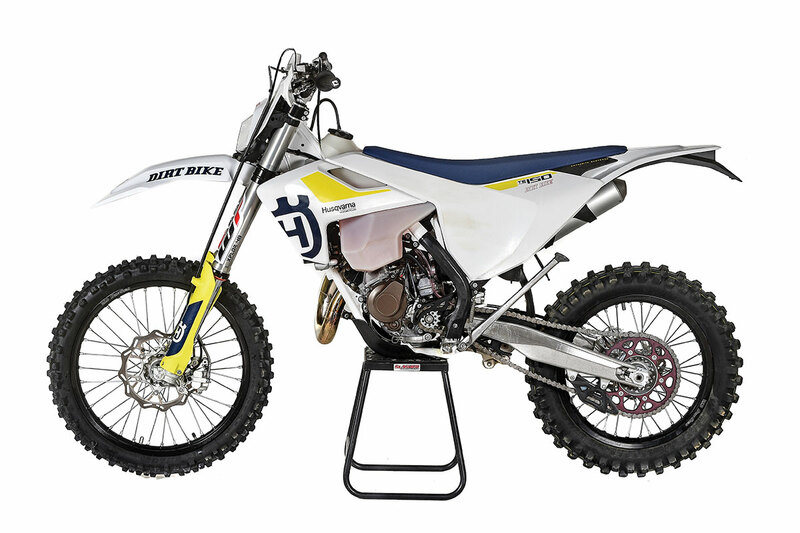 Husqvarna’s current version of the 150 dates back to 2016 when the company’s 125 motocross two-stroke was redesigned. It wasn’t a radical remake; the 125 didn’t get an electronic power valve, fuel injection or any other technology that you might expect of a 21st century two-stroke. The new motor has much the same general description as always; it is a case-reed design with a centrifugally driven mechanical powervalve and a carburetor–this time a Mikuni TMX38. It did get the provision for an electric starter, which came later on the 150 off-road version. Unlike the earlier incarnation of the 150, this one has the same stroke as the 125 and owes its added displacement entirely to a 4mm increase in bore. The bike actually displaces 144cc. Along with the electric starter and the displacement increase, there are differences in engine tuning, mostly gained through digital mapping. The ignition is different, and the flywheel is heavier. Both the motocross 125 and the off-road 150 have six-speed gearboxes, but the gear ratios are all different, aside from third. The ratios below third are set up for slower speeds, and the ones above are taller. Top gear isn’t that much faster for the TE, though. Sixth is only geared about 8 percent taller, whereas first is something like 17 percent lower. Clearly, the thinking is that this bike will be used more extensively on tight trails and low-speed terrain. The 150 also got a larger fuel tank (2.6 vs. 2.0), an 18-inch rear wheel, Dunlop AT81 tires, a sealed chain, a headlight and a digital odometer. 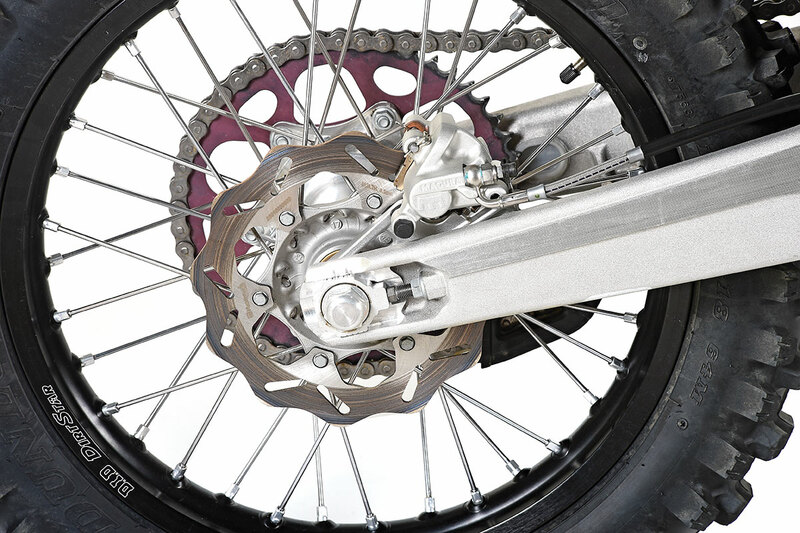 For the off-road bike, the fork is a WP Xplor 48 with coil springs rather than the WP air fork. The rear suspension is similar to the motocross version aside from spring rate and valving. It’s still a linkage system, unlike the KTM version of this bike, which uses the PDS, no-link design. 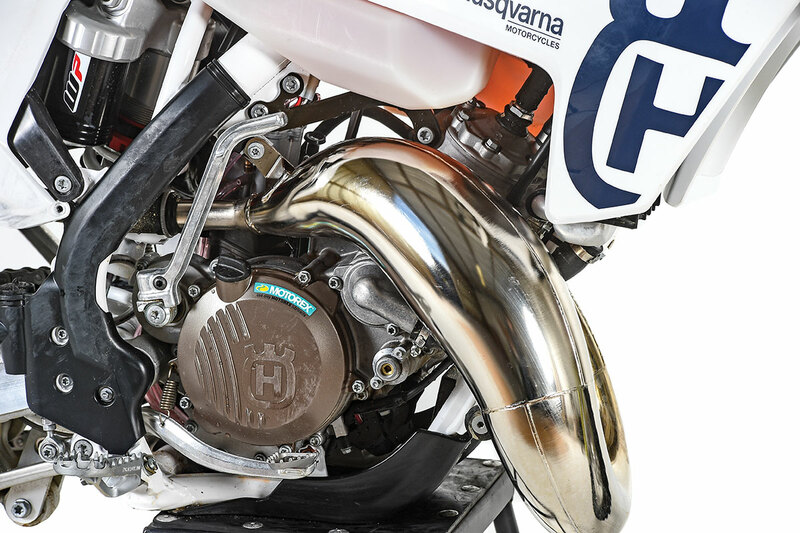 The Husky also differs from the KTM 150XC-W in brakes (Magura on the Husky, Brembo on the KTM), clutch hydraulics (again, Magura versus Brembo), handlebar maker (Pro Taper versus Neken), and rims (D.I.D versus Excel). Then there’s also the bodywork, airbox and subframe, which are all different, primarily to give the Husqvarna brand its own look. 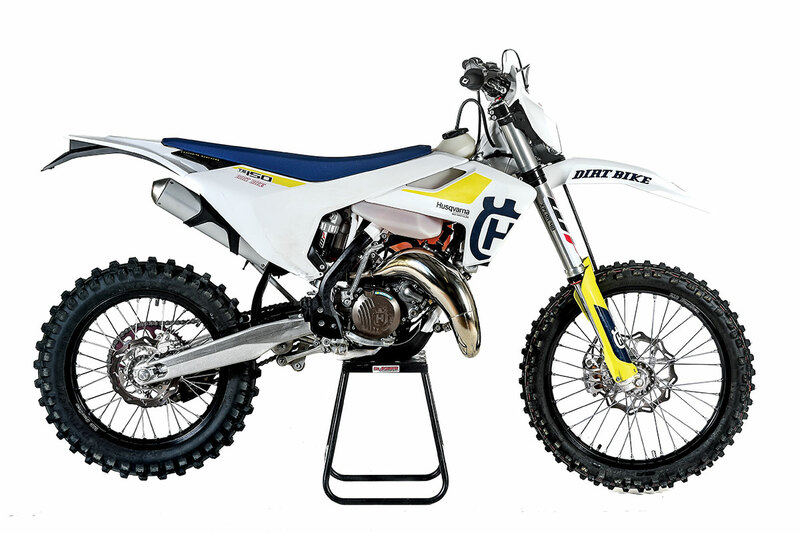 In order to make a 125 motocross bike into the TE150, Husqvarna added electric start, 4mm of bore and a whole lot of off-road mojo. If you want to understand why this bike is so good, it can be boiled down to one number: 205. That’s how many pounds it weighs on the Dirt Bike scale without fuel. You could strap the TE150 on the rear fender of a Honda CRF450X as a spare and probably not notice. We often hear people lament the loss of old-school bikes such as the Kawasaki KDX200, but we think their memory is clouded by nostalgia. Yes, all the 200s of the past were sweet motorcycles, but the KDX was around 40 pounds heavier. Even the last generation of the KTM 200 was at least 20 pounds more. The Husqvarna TE150 is so light that you barely have to think about what you want to do and where you want to go. The bike reacts almost before your brain can take action. Hyperbole aside, there’s a reason that the 150 is so agile that goes beyond the actual weight. The spinning crank of a small-bore two-stroke has less gyro effect than the big four-strokes we’ve grown accustomed to. There are various physical laws written by oddly dressed renaissance thinkers that say that massive spinning things like to maintain their place in space. Smaller spinning things, such as the internals of the 150, are much easier to move around. Power is also inversely related to handling, but that isn’t to say that the 150 is slow. It’s much more powerful than the 250F motocross bikes of just a few years ago. When you rev the Husky and shift on queue, it can hang with a modern motocross bike on flat ground, but it’s not much of a hill-climber. Sand, deep loam and steep terrain are the natural enemies of the small two-stroke. There’s very little torque once you fall off the bubble. If you’re a 125 guy, you already knew that coming in, but the 150 is still much easier to ride than a traditional 125 MX bike. It has enough torque to pull itself into the meat of the power without ever using the clutch, if you so desire. The jetting is flawless, and there are no glitches or bogs anywhere in the rev range. Even in the sub-basement at idle rpm, the bike is difficult to stall. If you’re in a hurry, though, a little clutch work speeds up the process. Sometimes it takes a lot of clutch work, depending on how impatient you are. As a side note, the TE150 has a much sweeter, easier-to-use powerband than the KTM 150SX motocross bike, even for motocross. It doesn’t have the peak power of that bike, but the TE150’s hit is so much mellower and easier to manage that almost everyone prefers it. Husqvarna uses multiple suppliers for some components. 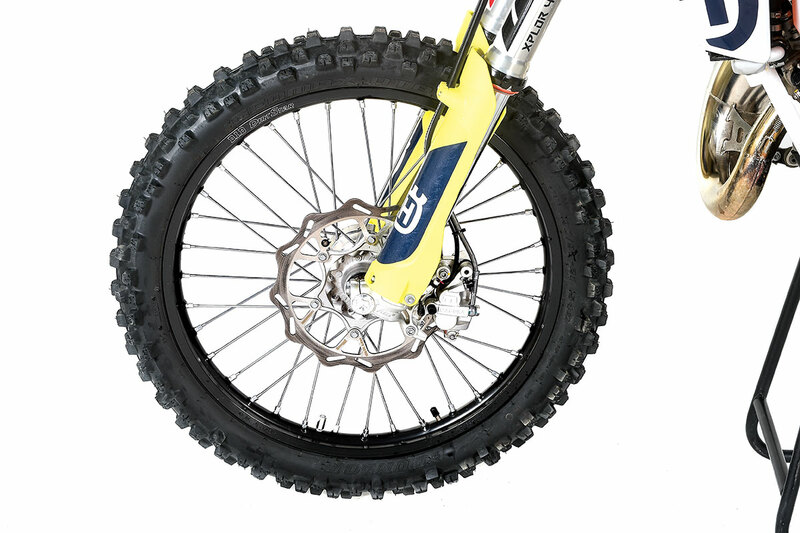 Off-road bikes like the TE150 come with Magura brakes, whereas the MX bikes come with Brembos. The performance is similar, although the Magura units tend to be noisier. 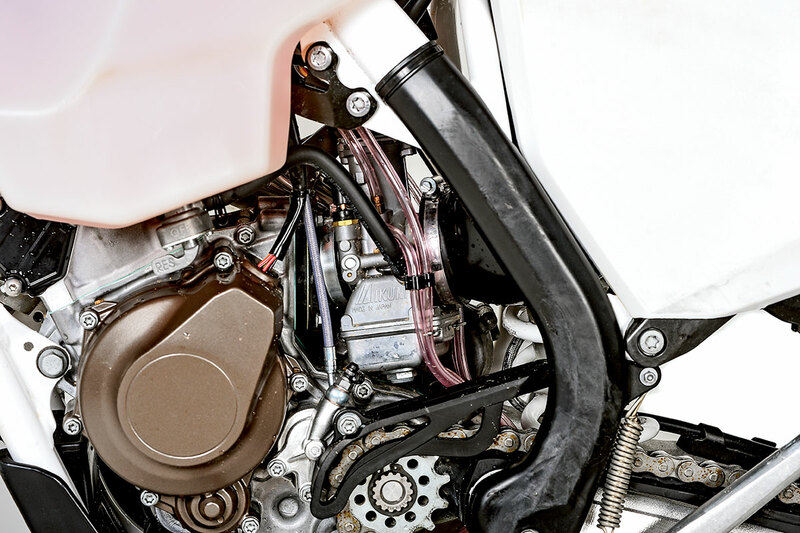 As counterintuitive as it might seem, truly lightweight motorcycles often are at odds with their own suspension components. It’s hard to get a really plush ride when the motorcycle moves and reacts so quickly because of those aforementioned physical laws. The TE150 can transmit a lot of small impacts to the rider despite having comparatively soft settings. The front end is a little divey and harsh at the same time–it’s that way on all the bikes we’ve tested with the WP Xplor fork. The good news is that it doesn’t matter that much on bigger impacts. The 150 is so easy to handle that even when you get out of shape, it’s easy to recover. This is one of those bikes that makes you think you’re a stronger, faster, more talented rider than you really are. Running weight, no fuel 205 lb. 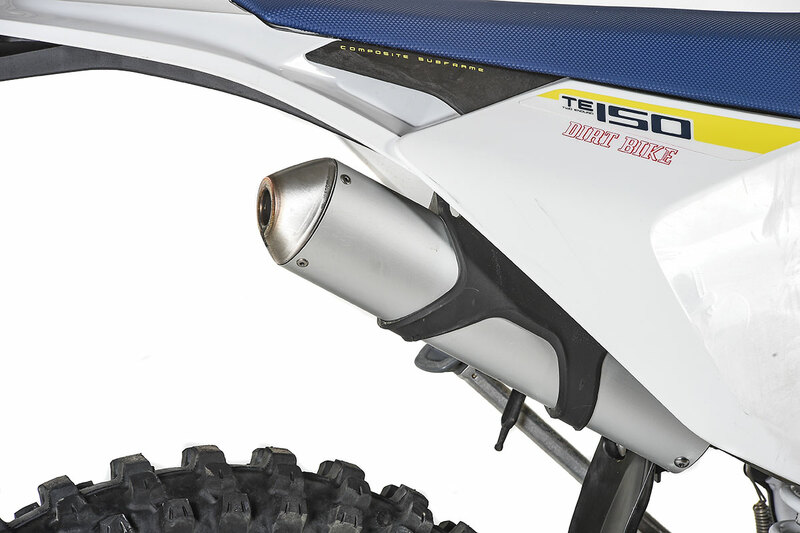 The 150’s muffler doesn’t have a spark arrester, so if you plan to ride on public land, budget for one. The list of other things we like about the 150 goes on and on. The electric start is awesome, not because a small two-stroke is hard to kick, but because you can restart easily on the side of a hill when you can’t get to the kickstarter. We still like the fact that the kickstarter is there, too, just for backup. We like the brakes; we like the feel of the clutch; we like the dual-map switch, and we like the fact that it’s not loud. Is this the modern day 200? No. A 150 has its own identity. It’s worthy of a cult all its own.